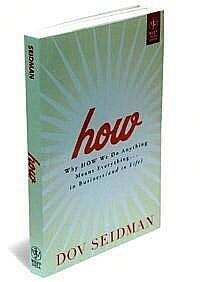 How—Why How We Do Anything Means Everything...in Business (and in Life): By Dov Seidman, Wiley India, 338 pages, ₹ 599. Today’s business environment is marked by an overload of, and easy access to, information, transparency of actions and availability of anything, anywhere—and it calls for a new set of rules. When “what you do" in your business becomes easily replicable, “how you do it" may be the differentiating factor that sets your business apart from the competition. That’s what Dov Seidman proposes in his book, How: Why How We Do Anything Means Everything… In Business (and in Life). Chairman and CEO of LRN , a company he founded in 1994, Seidman has been helping companies and their employees conduct their businesses in today’s challenging environment, emphasizing that the so-called “soft" qualities like trust, integrity and reputation are now the “hard" drivers of business. Developing leaders: Self-governing requires each individual to step up and lead, with only values to guide them. Values-based self-governance minimizes the layers of hierarchy within an organization. At GE/Durham (a General Electric plant in Durham, US), decision making eschews middle management because there is none. There are no silos and there is little separation of functions; all governance functions reside within each individual. Almost nothing happens without a chance for everyone’s input; thus almost every initiative is an expression of the group. At Sewell (Sewell Automotive Companies in the US), each self-governed team takes responsibility for every aspect of a vehicle, which allows them to deliver a superior experience to their customers in a more efficient and responsive way. Unlike the hoarding or need-to-know information flow of blind obedience and informed acquiescence cultures, values-based self-governance requires that information be readily available to all when they need it. Information unleashes ability. To unleash the power and creativity of a workforce of inspired leaders, you must create an environment that unleashes the information they need to succeed. Transparency between people at all levels in all transactions actually makes these cultures stronger and more effective, and the free flow of information makes cultures more self-governing by increasing trust. Blind obedience and informed acquiescence cultures tend to build their workforce skills through rote learning and through training programs, respectively. While these approaches to worker knowledge can be an efficient way to disseminate black-and-white, easily quantifiable information—like maximum pollution levels or safety performance metrics—they don’t do enough to prepare people to wrestle with the infinite shades of grey they now face in the course of a working day. You cannot train someone to struggle in the Valley of C (a term from an earlier chapter, used to refer to a space where you’ve trusted the wrong people and been betrayed), but you can develop your ability to do so. You train a dog, but you develop leaders. Thomas R. McCormick, director, global ethics and compliance for the Dow Chemical Company and one of the true thought leaders on the relationship between values and business performance, told me a story about how Dow is investing in the education of its team. “We are asking every supervisor in the company—there are about 2,000 of them—to have a face-to-face education session with their employees to take them through three or four scenarios (such as conflicts of interest), really tough, grey-area issues that would be relevant to that work group, whether it is a business or a function or a geographic location or whatever," he said. “The goal is to really have people talk through some of these areas where there aren’t any good black-and-white answers, and collectively explore how they would handle the situation. It’s educational, but it also sets a tone. They see their leader talking through it with them, and that reinforces what leadership expectations are. All of that is designed to help people manage the grey, which you can only do by making values-based decisions." The conditions of the networked world make pushing vast amounts of information to workers’ fingertips cheap and easy, but it must come with a concomitant dedication to education. At GE/Durham, it means multiskilling. At Sewell, it means the rich stories, told again and again, and modelled in everyday behavior.